Irish dramatist, critic and writer. ALS. 1p. Ayot St Lawrence, Welwyn, Herts. 15th July 1939. To Miss [Gladys] Storey. "I have just finished reading 'Dickens's Daughter'. May I ask you a question as to the account you give of Mrs Dickens' death on page 164? Did Kate tell you that herself? - I mean the reference to the letters and the British Museum? Faithfully, G. Bernard Shaw. P.S. I should have introduced myself as a friend of Kate whom she told me some things that she did not tell to anybody." 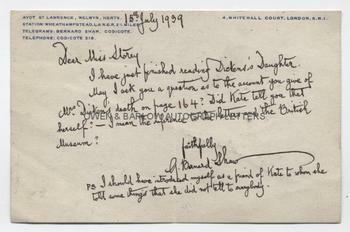 With a pencil note by Gladys Storey on the verso "Implied that Kate did tell me herself. G.S". Oblong 8vo. Approx 7 x 4.5 inches (18 x 11.5 cms). Old central fold. In fine condition. The artist daughter of Charles Dickens, Kate Perugini, had been the subject of a biography by Gladys Storey ('Dickens and Daughter' London. Frederick Muller, 1939) which had caused some controversy by revealing the affair that Charles Dickens had had with the actress Ellen Ternen. Kate Perugini had maintained a close friendship with George Bernard Shaw, J.M. Barrie and other literary figures of the day. 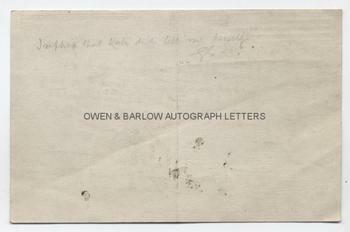 It appears from this communication that George Bernard Shaw is questioning the reliability or veracity of Miss Storey's source for one of the occurrences referred to in her book - or else is surprised that he was not already privy to this information.